The Nissan Pathfinder has been a popular SUV since its debut in 1986. Originally geared towards young male buyers, the Pathfinder has evolved into a sporty family friendly SUV. Its body and towing capacity has improved throughout the years making it a fierce competitor amongst the saturated SUV market. The early two door model of the Pathfinder was equipped with a 3.0 liter V6 engine. Its off road capabilities were strong, but the size and power of the vehicle were far less then more current models. By 2000, Nissan improved the engine power of Pathfinder by including a 3.5 liter V6 engine. In addition, an impressive 240 hp and 260 lb-ft of torque gave the Pathfinder the boost it needed to stand out. The later models of the Pathfinder saw a truck based design and a strong 7,000 pound towing capacity. 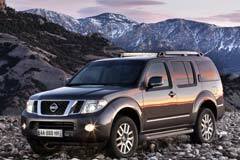 Customers looking to buy a used Pathfinder can find models that fit most lifestyles. Whether looking for a family vehicle or a powerful and spacious design, the Nissan Pathfinder has a used model that can fit your needs and budget. 2017 Pathfinder SL 2017 Nissan Pathfinder, Magnetic Black Metallic with 41422 Miles available now! Pathfinder S 2016 Nissan Pathfinder, Gun Metallic with 46870 Miles available now!